Golden State Warriors point guard Stephen Curry had an interesting take on playing the Oklahoma City Thunder on the day before the Super Bowl. 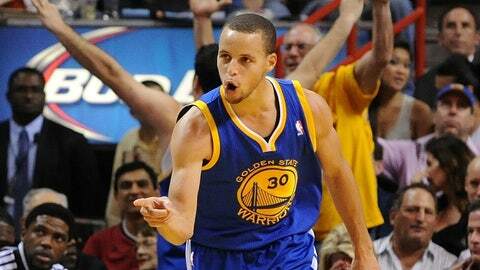 Golden State Warriors sharpshooter Stephen Curry is the NBA’s lovable MVP. Modest. Soft-spoken. A genuine article. Or so they say. Truth be told, Curry talks smack with the best of them. He was on top of his trash-talk game Thursday when reporters asked the Charlotte, N.C., native about playing the Oklahoma City Thunder the day before his hometown Carolina Panthers take on the Denver Broncos in Super Bowl 50. Stephen Curry on the Warriors playing Oklahoma City Thunder the day before the Super Bowl: "It'll be a good 48 hours – a win and a win." On the court or off, Steph does not disappoint. Good thing it wasn’t his good friend Cam Newton who pulled out the Warriors-Panthers double prediction. Imagine the roasting the NFL’s largest lightning rod would absorb for such a display of public cockiness. Curry, though, nah. He skates. We laugh. But, you know what? The NBA desperately needs it. LeBron James is no longer a league villain. There’s no heated rivalry to really speak of. There’s no bad blood in the NBA. Everybody loves Steph. Everybody loves the Spurs. The Lakers are a joke, impossible to hate. Boston is just kind of there. Even Carmelo Anthony and the Knicks — thanks, Kristaps — are likeable. LeBron won two titles, tugged on our heartstrings on his way back to Cleveland, so even getting his coach canned can’t turn back the clock. The NBA is much more interesting when there’s bad blood ready to boil. Now Curry’s stirring it up, and just in the right place. Curry and the Warriors blew past Oklahoma City and Kevin Durant in the league’s hierarchy with blinding speed. The Thunder were supposed to be the next champs, and for years to come. Thunder injuries and Curry’s brilliance, along with first-rate front-office maneuvering, totally changed the game. Durant has spent a good deal of time this season reminding people that the Thunder are still here, that the West boasts a Big Three and not a Big Two. You can be sure that the Twitter-savvy Durant is well aware of Curry’s cocksure prediction. Curry vs. Durant, Warriors vs. Thunder is must-see TV no matter what. That Curry just amped it up doesn’t hurt a bit. In fact, NBA commissioner Adam Silver should send the reigning MVP a thank-you note.